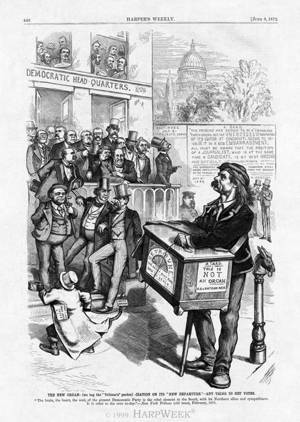 The New Organ” is a provocative full-page cartoon in which Nast presents the recently nominated Horace Greeley as dupe of the Liberal Republicans, especially of the candidate’s campaign manager, Whitelaw Reid. On May 15, Greeley had transferred editorial control of his newspaper to Reid for the duration of the campaign and unconvincingly announced that the Tribune would cease to be a party organ. The prospect of an organ that was alleged not to be an organ was irresistible fodder for Nast. It lent itself directly to this cartoon of acting editor Reid as a hand-organ operator using Greeley as his trained monkey while they troll for votes in front of Democratic Head-Quarters. Vice-presidential nominee Gratz Brown is a tag on the monkey-Greeley’s tail. The organ’s repertoire consists of “The Bonny Blue Flag,” a Confederate war song (adapted from the Texas War for Independence), and “Erin Go Brach,” an Irish song of rebellion against the British.